The last time we passed through Seattle on our way to Portland, we had originally planned on doing breaky at 5 Spot. Unfortunately, there was a wait out the door and with 2 hungry kiddies in tow, that was not exactly what the prevailing situation ordered. 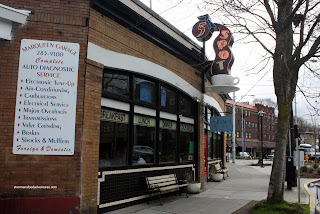 Hence, we went a block up and had a wonderful breakfast at Cafe Bonjour, which now has since closed. Fast forward 8 months later, we find ourselves heading to Portland again and in need of food in Seattle. This time around, we were arriving on a Monday and prior to lunchtime. Bingo! After only a short wait, we got a table and the one right by the window no less! Looking over the menu, it was a bit difficult to choose from the decent array of options. I was torn between the Plank Cut Fish 'n Chips and the Red Flannel Hash. So the solution was to order the Fish 'n Chips for my daughter. Hey, she won't mind me trying her food right? We ended up getting the kids portion and that worked out quite fine since it wasn't very big. 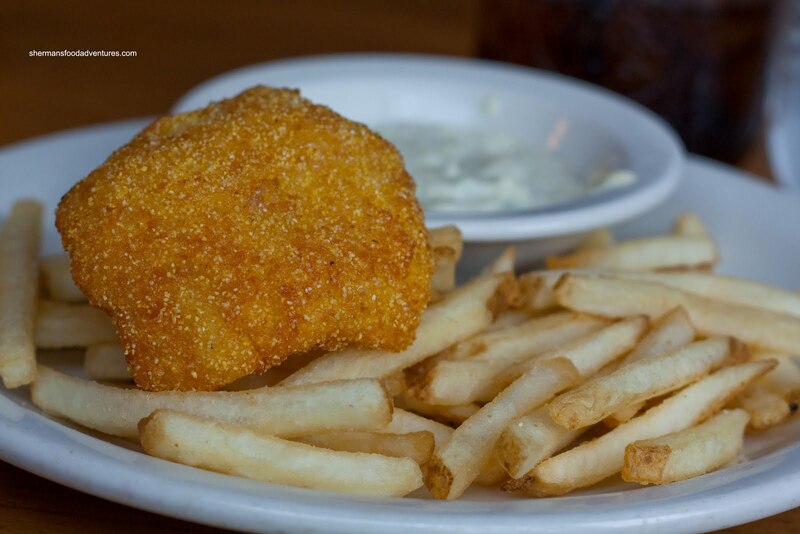 What makes this fish 'n chips interesting is the cornmeal batter. It really gives a profound textural contrast to the soft, flaky fish. We like it and also the very crispy fries. We enjoyed the tartar sauce, although it could've used more zip. 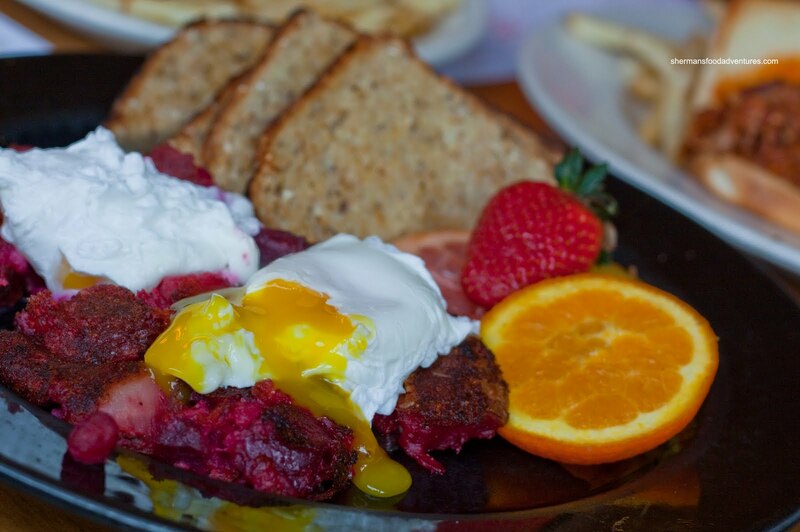 As for the Red Flannel Hash, it is named as such because of the beets combined with potatoes and corned beef topped off by 2 poached eggs. As you can see the eggs were perfectly runny while the hash is noticeably red. I liked the addition of beets to this. It made the hash less heavy and added a whimsical colour. The potatoes were nicely done while the corned beef got kind of lost in the whole thing. Now lost would be the complete opposite of the Memphis Blues BBQ Pork Sandwich which Viv ordered. 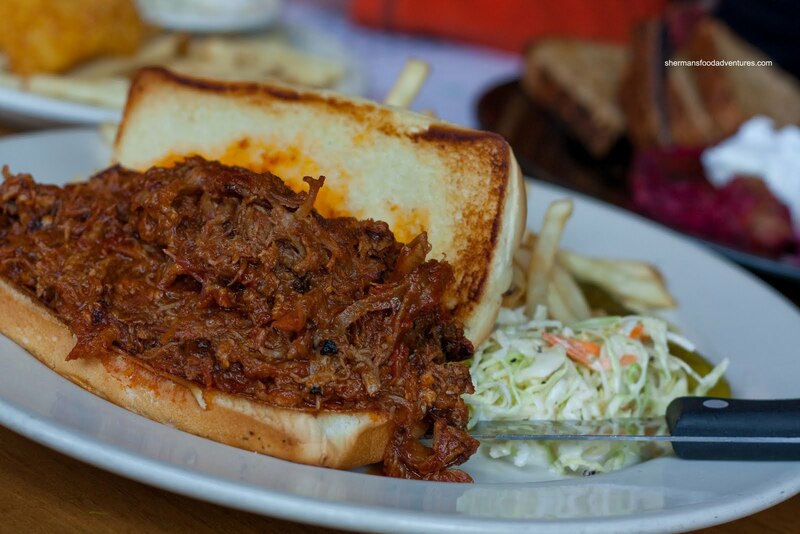 The shredded meat was absolutely in-your-face good. The meat was remarkably tender with just the right amount of sauce while hitting you in the gut with a pronounced smokiness. We felt the BBQ sauce had a good balance between the tang and sweetness. The only thing we would've liked was a sturdier bun because it began to disintegrate shortly into a few bites. The side of coleslaw as very good with a nice crunch and tang. As drum roll... Guess what my son had? 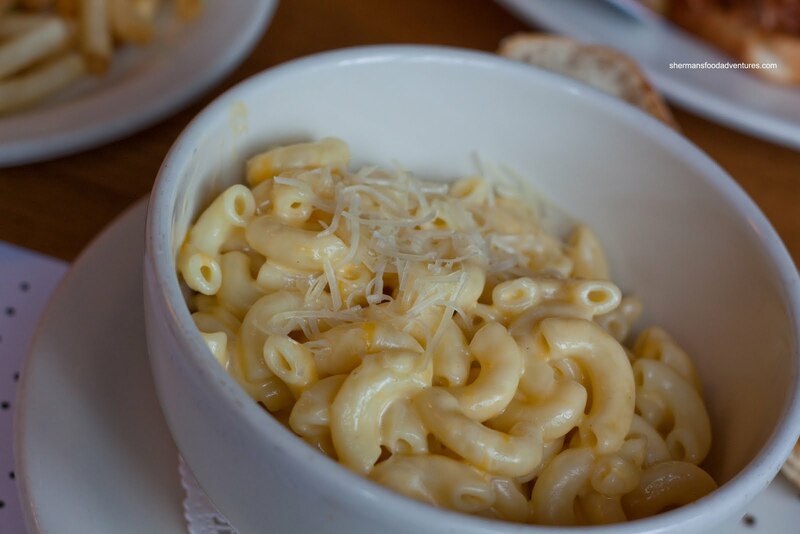 Ah yes, the Mac 'n Cheese. What else? Arriving in a honking huge bowl, this was enough for both kids (which it turned out to be). The noodles were perfectly cooked being on the al dente side. Believe it or not, my kids prefer this over mushy, even though that is the safer texture for most. There was a subtle cheese flavour; yet maybe too subtle. Even the kids thought there needed to be more salt. And we did add salt. That made it sing. So not a huge problem. They might've done that on purpose to appease more kids. All-in-all a very pleasant meal at 5 Spot. Is it worth the usual wait? I'm not completely sure since I had lineups; but our short wait was fine. Food was solid, prices were okay and service was good.